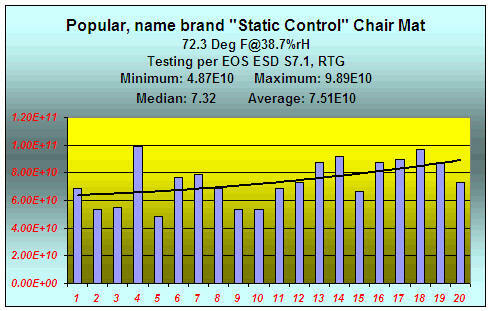 UltraStatic Control MISSION CRITICAL ESD chair mats - The Portable ESD Floor for your Workstation! Shown with optional border of esd aisle marking tape (available as an accessory on this page). UltraStatic Titanium Mission Critical ESD chair matting = The portable ESD floor for your workstation! Full Certification to ANSI ESD S20.20 standards using NIST in compliance test instruments is available for a minor upcharge of $35.00 per mat. ESD Chair Mat for Covering Hard Surface Flooring (tiles, epoxy, concrete etc.) and thin pile direct glue down carpeting. The portable ESD Floor for your workstation! Fully compliant to the NEW ANSI and NFPA 484 standards! ESD conductive chair mats for standard hard surface flooring and THIN pile glued down carpeting Ultimate static control for mission critical manufacturing. MEETS the new ANSI ESD S 20.20-2014, 97.2 standards<100 volts (actual <10 volts). PERFECT for electronic assembly, Military applications, FAA Command Centers and others requiring impressive static conductivity and full compliance to the latest most stringent standards! Please Note: This items is NOT included in our free ship program. Chair casters often act as tiny ball mills grinding dirt, wire clippings even nuts and bolts deep into your hard surface flooring and even bare concrete. Results: Unsightly scratches, gouges and DIRT. The problem is compounded in electronic assembly by the need for advanced electrostatic control. Not only must the mat protect the flooring, it must provide unparalleled electrical conductivity in order to dissipate the electrostatic potential generated by the contact and separation of the chair casters rolling on the matting or the technician walking on the mat. Prior to the new standards antistatic floor mats merely had to provide an electrical resistance to ground slightly below 1.0E09. But with today's new requirements the ESD flooring (or matting) surface must fall in the conductive range of <1.0E06 to provide the recommended resistance between the operator / heel grounders and floor matting surface of <3.5E07. Why the changes? Many sophisticated components are simply too susceptible to damage from even low voltage electrostatic potential. Many ordinary anti-static mats rely on the ambient humidity in the environment to render the mats even slightly conductive. When the humidity is high (>60% rH) they sometimes meet the old specifications for electrical conductivity (coming in slightly below 1.0E09) BUT when the humidity drops they become insulative! A mat's electrical conductivity to ground tells the tale. Does this normal antistatic mat really work? Not really. A piece of dry wood comes in about as conductive as this popular mat AND it's not even close to being conductive enough to comply with the latest requirements of ANSI ESD S 20.20 for conductive flooring or 97.1 technician / heel straps / flooring requirements. Our UltraStatic Control Chair mats are custom manufactured here in Colorado using our Titanium static conductive (not mere anti static) ESD flooring sheet vinyl. This material features an unbelievably hard wear resistant top surface laminated to a full surface conductive backing and provides ULTIMATE permanent static conductivity in all environments and at all humidity levels. Your custom cut ESD floor mat comes complete with industry approved ground cord and full electrical certification using the latest test methods! United's Mission Critical ESD Floor Mats Tame the Static Beast BEFORE it Takes Another Byte! Slip resistant and thin, reduces tripping! Fully compliant to the NEW ANSI and NFPA 484 standards! WARRANTY: These mats are warranted for LIFETIME Static Control Performance, LIFETIME topical wear performance and LIFETIME compliance to ANSI ESD S20.20-2014, and NFPA 484-15* ESD Standards. The ground cords are warranted for one year. These mats support chair caster traffic nicely but they are NOT designed for continual substrate to mat chair caster traffic. This type of traffic may cause chipping to the edges of these mats. Edge chipping is NOT covered under the warranty. BE SURE to order your mat in a wide enough width and long enough length to avoid this issue. Remember: The chair should always stay on the mat. Use ONLY ElectraClean and water or ElectraMat to clean these mats. Other cleaning chemicals may leave an insulative residue and make the mats brittle. *Note: May require a resistor free ground cord for NFPA and DOD standards. Note: These mats are built to order and custom cut to size. They are not eligible for refunds or returns.